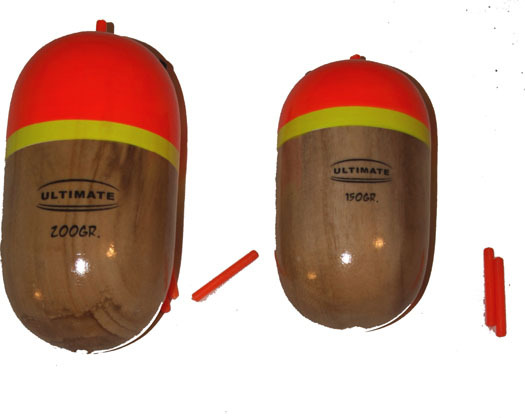 Ultimate catfish floats are made of semi hard Balsa & come in the two sizes pictured here. They are labeled 150gr & 200gr but they will hold up a lot more ! 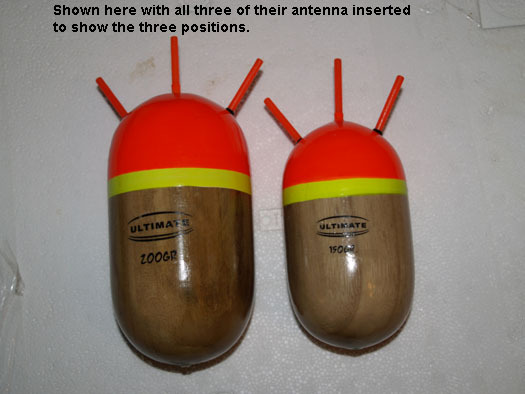 They have three places for the stops/antenna or Glow sticks to go, & are painted with hard wearing florescent orange paint, which is visible for well over 1000m on a normal day. With glow sticks added at night, you will get the same sort of range of visibility (not that many people fish at that sort of range) but you can't miss them when they are on the water. Being semi hard balsa, you can repaint them if you trash them, unlike the foam ones ! These will take a lot of punishment, one guy even ran one over with his hire car ! But we don't recommend treating your tackle in this fashion.